This, right here, marks my 500th post since I started doing this and kept with it. The number would be a lot bigger if I never bothered to delete everything I had previously written (multiple times) to start anew but it is what it is. 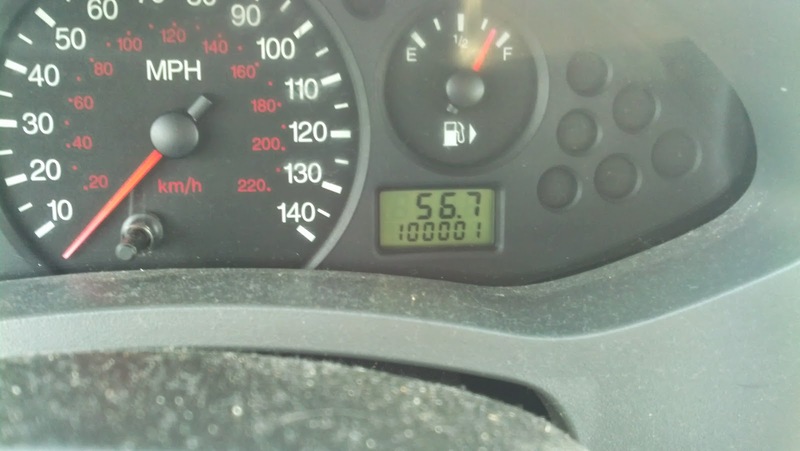 With that I thought I should share another Milestone. I glanced down at a red light the other day and noticed that my odometer had just passed the 100,000 mile mark. This will be my last post until I get back from Disneyland. We take off on Wednesday and will be coming back on Sunday. I'm hoping to have a lot of pictures and a few good stories to tell. Maybe even some clean ones. I'm also hoping that 5 days out of town and eating poorly won't set me back too much. Even if it does I'll just jump back on the path I have been taking and right my wrongs. Today at work someone was asking me what I currently weighed and I told them. One guy mentioned that he was 189 and he's never been as big as me. I told him that by next April (by my wedding day) that I'd be down to his weight or less. He told me he'd buy me two cheeseburgers if I got there! Bet Accepted sir, bet accepted. Here is a really good article on how Tim Tebow had to renounce Jesus and now Worships Satan. Today the new patio door for my house got put in. I need to go shopping and pick up a couple of pairs of shorts now that all of mine are way too big on me. Hope everyone has a great end of week and weekend and I'll catch up with y'all next week sometime!